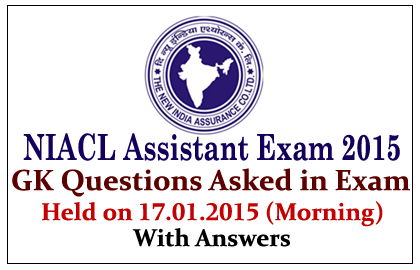 List of General Awareness Questions asked in New India Assurance Co. Ltd Assistant examination held on 17thJanuary 2015 morning batch. Candidates those who are preparing for this examination can use these questions for practice. Who is the Brand Ambassador of ICC World Cup 2015? Indian Science Congress 2015 was hosted by? Who is the author of the book- “Dramatic Decade”? What is the Venue of Common Wealth Games 2018? World Consumers Rights Day was observed on? What is the location of Satpura Ranges? What is the Tata’s share in Vistara? Which of the following bank has started the Monthly composite index? Who is the UN’s Goodwill Ambassador for South Asia? What is the deadline to exchange the currency notes that was printed before 2005? On who’s Birthday Good Governance Day was observed on? Which of the following Country has the Angara-A5 missile? What is the Head Quarters of WIPO? Who is the External Affairs Minister of India? J.Gutta is related to which game? Which of the following Country has Nikkei Stock Exchange?